GP4000 series has high connectivity with a wide range of industrial controllers and provides a variety of lineup in sizes, front colors, coating, and open frame. 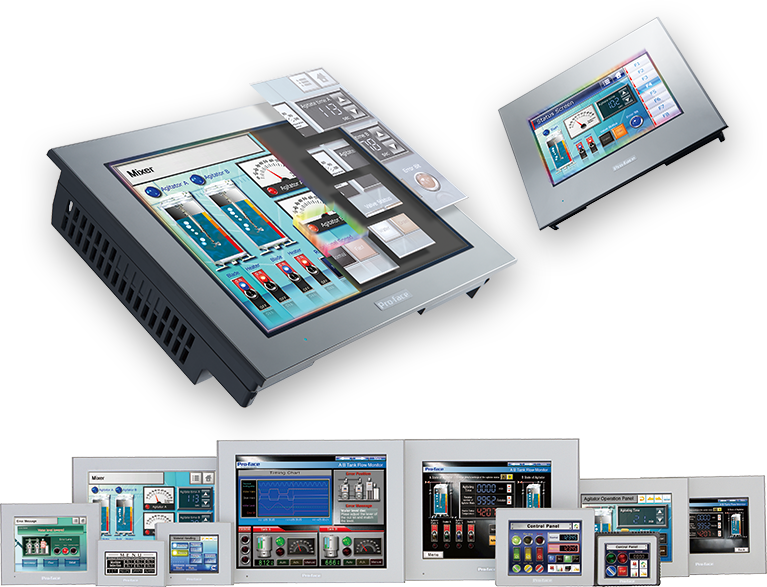 Pro-face Standard HMI, GP4000 Series flexibly satisfies customers' needs. Experience usability of Pro-face software such as screen creation, data collection, monitoring before purchase. GP4100 series is a high-performance model that supports data collection and mobile remote monitoring despite its small size. Three installation case examples of compact HMI are introduced this time. Though I created a smart HMI screen with high-resolution illustrations and animation, the screen’s response got worse. What can resolve it? Interview: Find inefficiency of lines through a user test. Resolve it smartly with a tablet.